My meditation teacher used this quote but she didn’t know the source of it. It’s really quite beautiful, but I am pretty suspicious it doesn’t come from the mouth of the Buddha. So this is basically an accurate quote. I don’t know where Geoffrey’s teacher’s version of the quote comes from. The only Samyutta Nikaya I have is Bhikkhu Bodhi’s. I think what the Buddha was doing here was encouraging the monks to set their intentions. 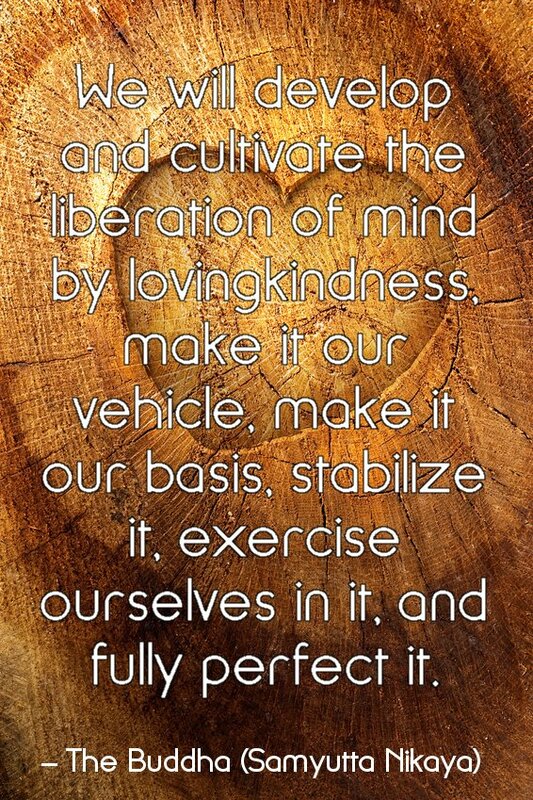 Those intentions outline a progressive sequence leading roughly from bringing lovingkindness into being, making it increasingly a part of our lives, and finally perfecting it so that there are no thoughts, words, or actions that are not imbued with lovingkindness. The word translated in the two versions as either “love” or “lovingkindness” is metta. These days my own preferred translation of this term is “kindness.” Metta is the desire that beings be happy and free from suffering, not because we necessarily, know them, like them, are related to them, or in any way connected with them, but simply because we know it’s the nature of beings to wish these things.